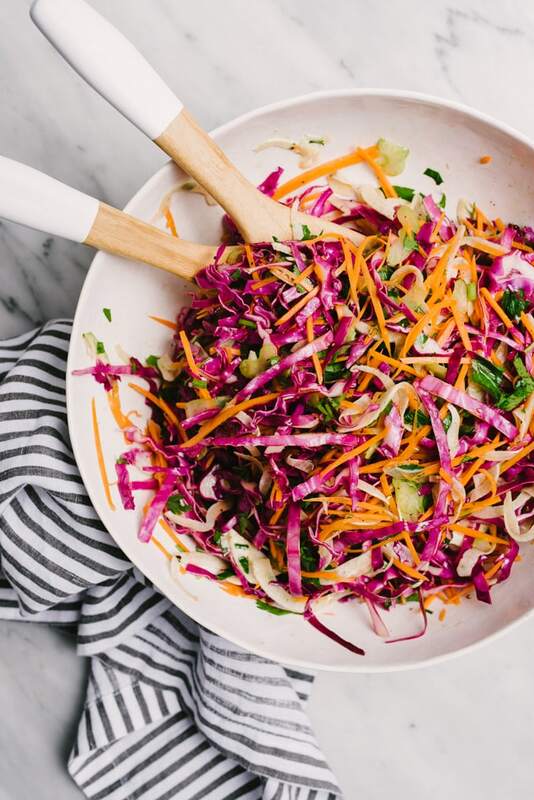 This apple cider vinegar coleslaw recipe is incredibly nutrient dense, loaded with Vitamins A and C. Not only is it a cold-and-flu-season superfood, it’s also easy and fast, super versatile, and darn delicious. 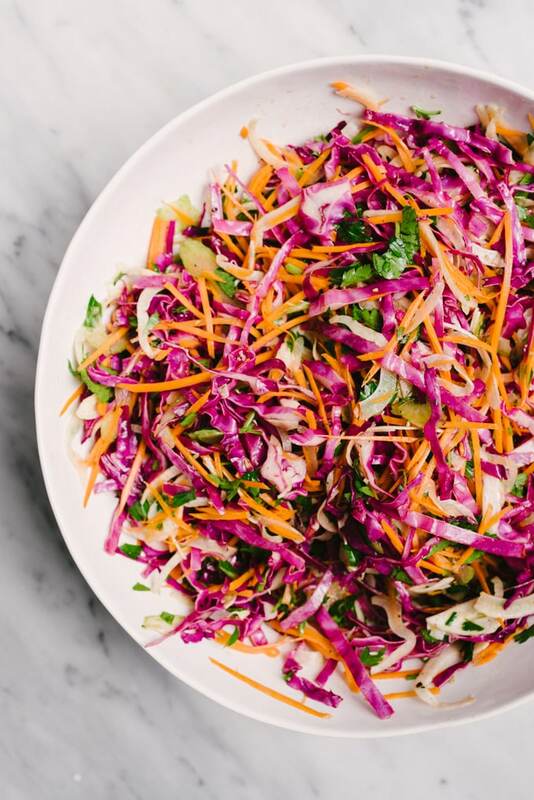 Tuck a few handfuls of this no mayo paleo coleslaw into a sandwich, add in some chicken for a salad, or enjoy it on its own as a side dish. Sometimes mom-ing so hard means all of the giggles, a dash of glitter, and heaps of kid magic. And sometimes? Yeah, sometimes it’s vomit and fevers and so much snot you could fill a river. Wanna guess what my last two weeks have been like? Three guesses, and the first two don’t count. Our little family has been recycling all of the germs, so I’m working on tuning up those immune systems. 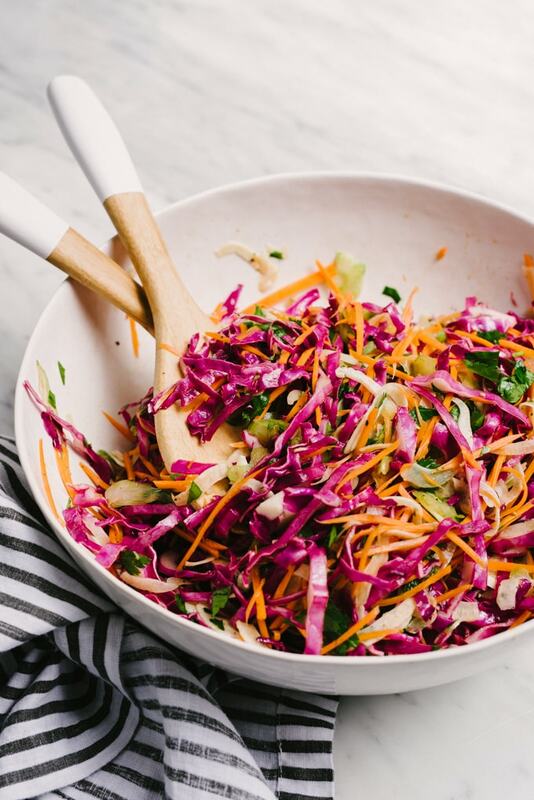 That means colorful vegetables, bone broth, and citrus are staples of our meals right now, and this super simple apple cider vinegar coleslaw fits right in. With red cabbage, fennel, carrots, celery, and a generous serving of apple cider vinegar, this recipe is a nutritional powerhouse, and it’s particularly dense in Vitamins A and C.
Having a gigantic batch of coleslaw in the fridge that keeps really well and can get tossed into any number of dishes is crazy useful. This no mayo coleslaw recipe is friendly for all of the diets, and you’ll find a place for it whether your paleo or Whole30, vegan or vegetarian, or just love really delicious food. I like to make a big batch of this slaw and use little bits all week. Throw in some greens and a little roasted chicken for a salad. Toss a handful into sandwiches, wraps, or tacos. It’s also delicious on it’s own, and I had a heaping serving with some scrambled eggs for breakfast (which sounds weird, but I swear it was delish). >>> Pin it now! 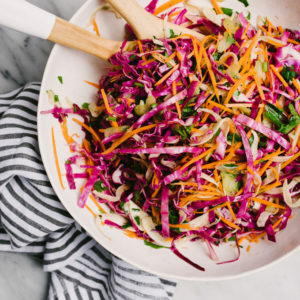 Click here to add this Apple Cider Vinegar Coleslaw to your side dish recipes board. Coleslaw is the easiest recipe ever – except for the chopping. I know. I bust out my mandoline slicer to make this process as quick and painless as possible, and to get crisp, uniform slivers. It slices and juliennes like a boss. If you don’t have a mandoline, it’s time to pony up! j/k. You can totally make this recipe start to finish with your chef’s knife, it will just take a few extra minutes. 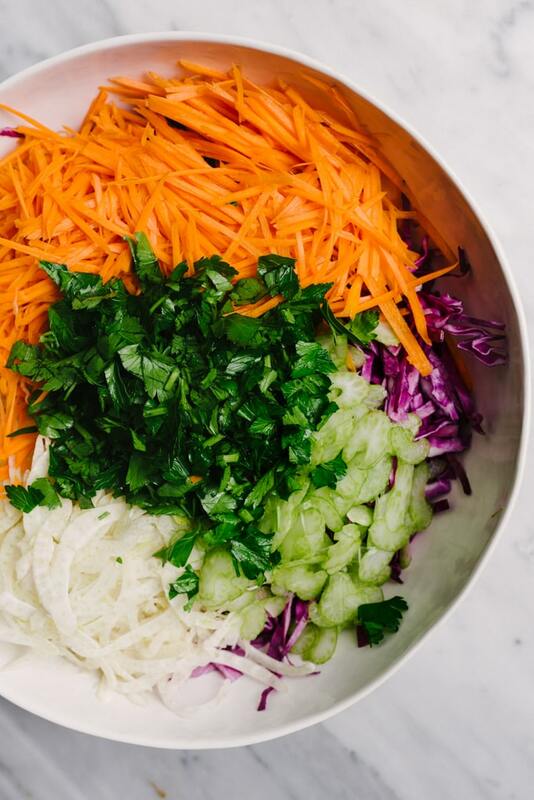 A totally worthy trade for a bowlful of yummy, nutritious slaw that will last for days. Please don’t feel limited to the veggies in this recipe. Swap out half of the red cabbage for green, and try adding julienned radishes, apples, beets, or jicama. For a crunchy topping, experiment with sesame or sunflower seeds. (I’d add the seeds just before eating, or they’ll lose their snap in the fridge). 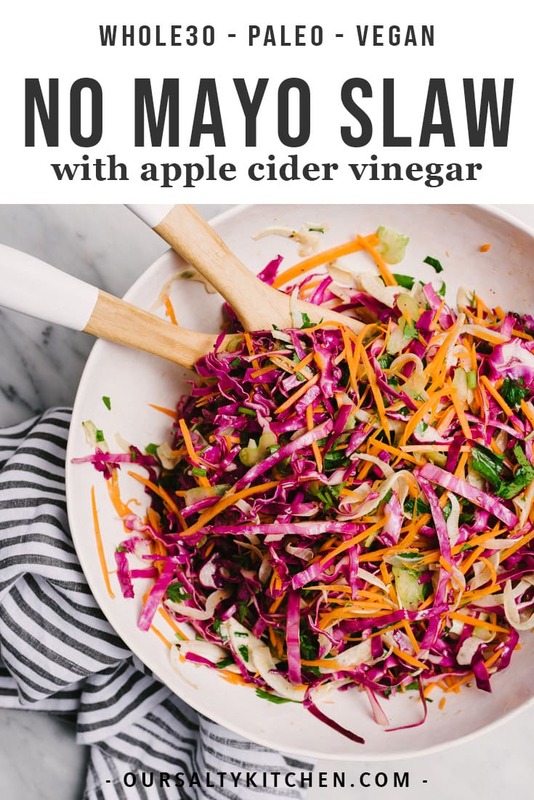 This no mayo apple cider vinegar coleslaw is best enjoyed after a few hours of marinating, and keeps in the fridge for about 4 days. Video: Watch How Easy it is to Make this No Mayo Apple Cider Vinegar Coleslaw! 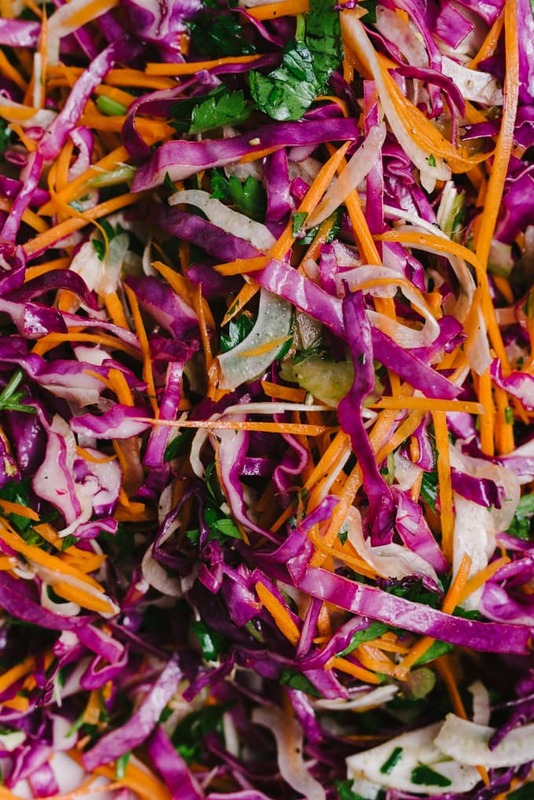 This autumn apple cider vinegar coleslaw is incredibly nutrient dense, and packed with Vitamins A and C. It's easy, fast, and versatile. Tuck a few handfuls into a sandwich or taco, toss with some chicken for a salad, or enjoy it on its own as a side dish or salad. In a small bowl, combine the vinegar, oil, honey, salt, and a pepper. Whisk to combine. Using a mandoline slicer or chef's knife, thinly slice the cabbage, fennel, and celery stalks. Use the julienne attachment on the mandoline or a box grater to julienne or grate the carrots. Chop the parsley. In a large bowl, combine the cabbage, fennel, celery, carrots, and parsley. Pour the marinade over the vegetables and toss to coat. This can be served immediately, but the flavor is improved by marinating in the fridge for at least 1 hour. This recipe keeps well covered in the fridge for up to 4 days. Add julienned radishes, apples, beets, or jicama. DID YOU MAKE THIS NO MAYO COLESLAW RECIPE? I WANT TO SEE YOUR CREATIONS! SNAP A PICTURE AND SHARE IT HERE ON PINTEREST.